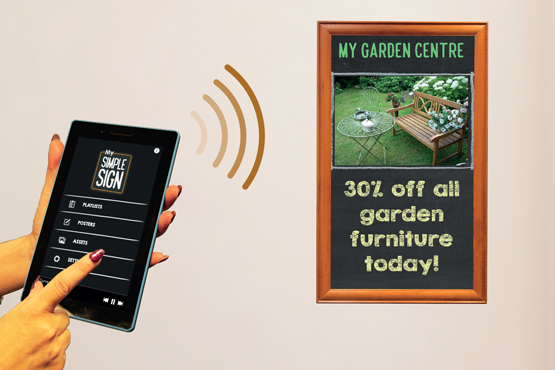 My Simple Sign enables you to take control of signage for your business at a local level. It’s a complete digital solution that is quick and easy to use, updates instantly, and offers unlimited opportunities to communicate information. But most importantly, it allows you to react to trading and events on a daily basis and maximise sales and performance. The product comes complete with its own tablet and app, meaning that everything you need is linked up and good to go immediately. All of the editing options are super easy! You can trial different offers and messaging to see what works best. No internet required, controller utiises local hotspot. Software updates are available by connecting the tablet to the internet. Connected controller allows for cloud backup. Offline administration and poster creation. Connected controller, Remote access by web-based CMS. Remote administration with appropriate local control. Varying levels of adminstration based on permission roles. If you have any questions about My Simple Sign, you can call or email us and we will get back to you as quickly as possible.